The weather in Los Angeles in the spring is like an earthquake with aftershocks. One day it is 80 degrees and the next day it is 50 degrees. And it goes up and down like that until the sun comes up on Fourth of July, and then it is 85 degrees everyday until October. So, today was 59 degrees, with rain, and Wednesday it is supposed to be 80. This bumpy weather is telling us to prepare to uncover and clean off the grill, and get out the bamboo skewers and BBQ sauce mop. It is time to start thinking about food to help keep you cool and dishes you can take with you to barbeques, picnics, tailgate parties, potlucks and brunches. 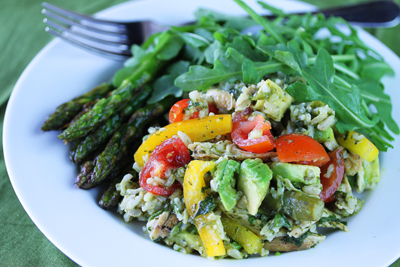 This rice, chicken, asparagus and avocado salad is just such a dish. I took it to a potluck last week and every morsel was eaten. I had to take out a little container of it before I set it out, so I would have some to photograph. The great thing about this salad is I prepared all the ingredients the day before and kept them chilled in a big bowl. The vinaigrette was made separately and put in a little container, so when I got to the potluck, I cut up the avocado and just mixed everything together. Voila! Actually, the only absolutes about this recipe are the rice, avocado and the cilantro puree vinaigrette. The avocado sort of marries slightly with the vinaigrette, making it lush and and a little creamy.You can use any veggies you have on hand. I always put chicken in it, but you could skip that and make a vegetarian version. Or use any seafood or meat in place of the chicken. Be creative. 1. Cook white rice according to package directions. Chill. 2 Cook brown rice (separately) according to package directions. Chill. 3. In mini-processor or blender, place vinegar, oil, sugar, garlic and cilantro. Blend until smooth. Season to taste with salt and white pepper. 4. 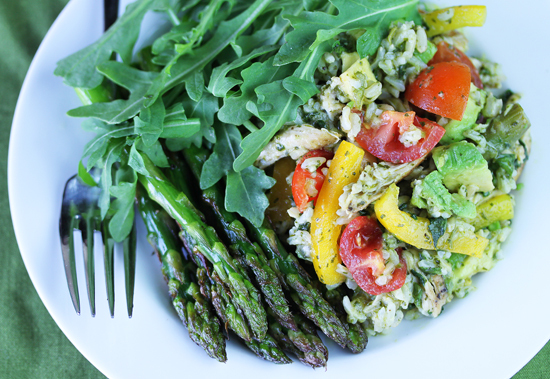 In a very large bowl, combine rices, chicken, green onions, tomato, endive, asparagus and avocado [and any other veggies you're using]. Toss with dressing. Adjust kosher salt, adding up to 3 teaspoons, to taste. 5. Serve immediately or chill to blend flavors. Note: I prepare the chicken tenders by first sprinkling them with salt, pepper and rubbed dry basil on both sides. Then saute in butter and minced garlic. Discard the browned minced garlic and scrape it off the cooked chicken. Or you can use any cooked white chicken meat. P.S. This is a huge salad, so don’t be afraid to use enough kosher salt to season. If salad is not moist enough, add more olive oil by tablespoon. Not being an asparagus lover, I was skeptical about this recipe. I shared my asparagus with my friend but ate everything else and loved it! For me, I’d use baby green beans. The viniagrette was great. That is one beautiful spring salad!!! YUM!! What a beautiful salad! I can’t wait to make it. Thanks for sharing!!! What a great light yet filling dinner. My family loved it. Thanks for sharing!